As many of you may know, this year the Provisional Players celebrate their 30th anniversary. 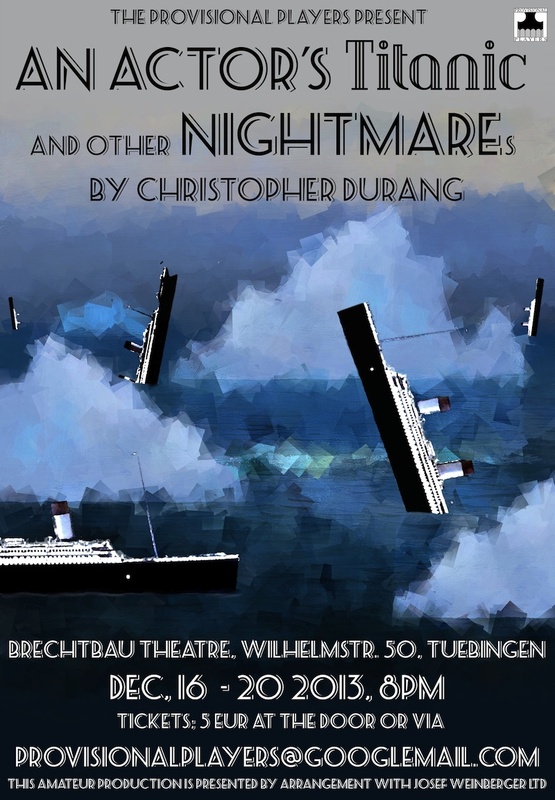 To celebrate this occasion, we thought of a special play that can bring together as many former and current Provisional Players members on the Tübingen BrechtBauTheater stage as possible! We are currently working on adapting „The Dead Eyes of London“, a crime novel by Edgar Wallace, into a comedy stage version. It will be done in the style of the 1960s/1970s film adaptions that some of you may be familiar with and should be a blast for all involved. 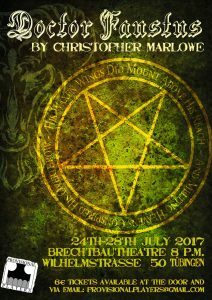 We´ll have a core ensemble of 5 to 6 people from the Tübingen area who’ll play the main characters who appear frequently in the play. 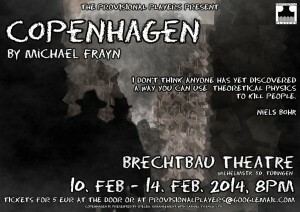 Those people will be rehearsing according to the usual BrechtBau theater schedule. 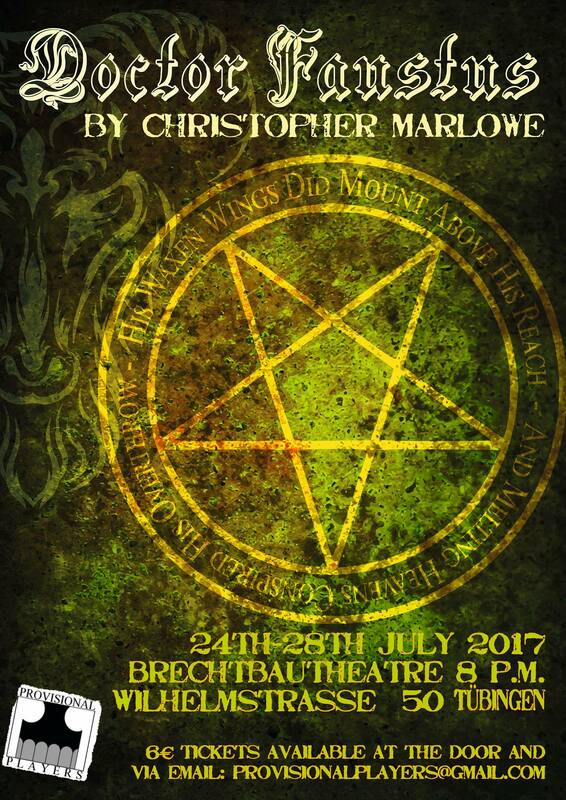 And: We will have around 20 juicy minor roles and cameos for people who come from further away or can’t come to regular rehearsals. 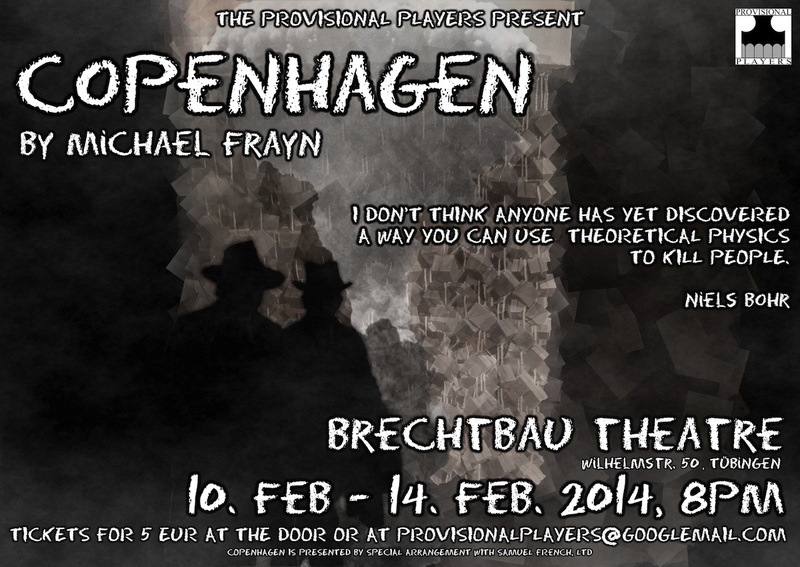 Those „external“ actors wouldn´t have to come to rehearsals until the very last days before performances. PLUS: For those of you who can´t come at all, but would still like to participate: We’re trying to work in a few video and audio effects that you may be able to record in advance. Germany in Anno XXXX. A timeless story of pride, wisdom and a tragic death. One survivor beckons and pleads to retell the events that happened the past few years. Aspiring to achieve greatest wits and knowledge one man surfeits upon cursed necromancy. He summons the lords of infernal hell to grant him his wishes but the price for this is paid with body and soul. Doctor John Faustus, prime scholar of the university has fallen to foul magic. His famulus, Wagner, aspiring to follow his master in his steps will soon learn that power always comes at a price and haughtiness is greatest before the fall. In the end only one will remain to tell the tale while the horned legion of demons will feast upon the fallen. 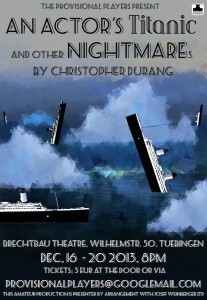 Performed in the BrechtBau Theatre, Wilhelmstraße 50, Tübingen. 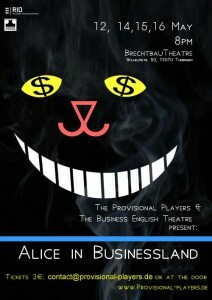 From Monday, July 24th, to Friday, July 28th, at 8 p.m.
Alice, a young college graduate is looking for a job. Just as she thinks she has finally landed the perfect job this is when her troubles actually begin. For Alice has been hired as a trainee at Hearts Tarts, a food company headed by a despotic CEO and run by employees who are – to say the least – a bit unusual. A hectic HR manager who doesn’t have time to look after new employees, a paranoid security officer, a singing accountant and the quarrelsome twins working in Marketing… And who’s this mysterious smiling person who tends to shows up at unexpected moments? It’s all very confusing for a young trainee who isn’t used to the very special corporate culture at Hearts Tarts. 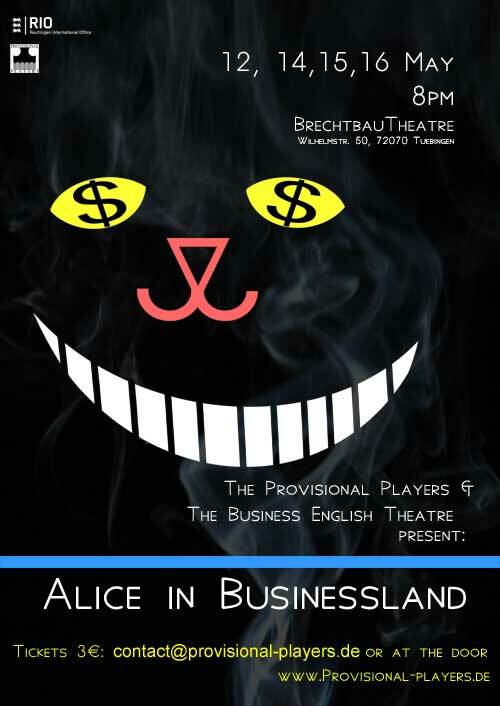 As Alice tries to navigate the corporate chaos, more and more responsibility is put on her shoulders. Will she be able to stay sane or will she succumb to the madness of businessland? friend and mentor Niels Bohr in Nazi-occupied Denmark. figure out for the rest of their lives how things could have gone so wrong. with the thing most difficult to understand of all – man himself. The Provisional Players present, as a special Christmas treat, an evening of fast-paced, outrageous and sometimes absurd comedy pieces by this year’s Tony award winner for best play – Christopher Durang. Have a Business Lunch in the Russian Tea Room, fight bureaucracy personified by the DMV Tyrant, and find out whether to keen in a Funeral Parlor. And if it really sounds like Eeeeeeck! Awoooooga! 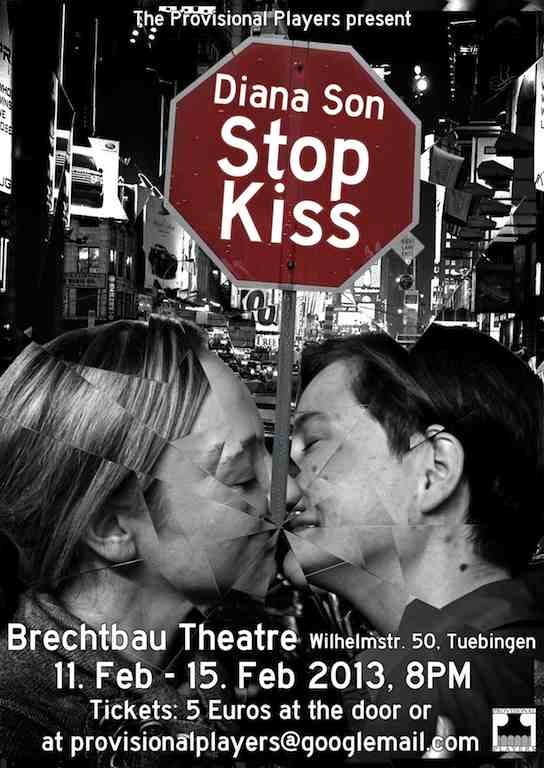 Come and join the show in the week before Christmas: 16th – 20th of December 2013, 8pm, in the Brechtbau Theatre. Stop Kiss – in Dublin! After the successful run of Diana Son’s Stop Kiss in the Brechtbau Theatre, the Provisional Players go on to give (hopefully the first of many more to come) guest performance in Dublin. And after the first kiss, it’s happily ever after. Isn’t this how it’s supposed to happen? Featuring life music by “Call me Heike”!